Gokarna Forest Golf Resort and Spa is the only International Course (full 18 holes) and is the best manicured golf courses in the country. The Himalayan Golf Club offers spectacular views and a once-in-a-lifetime opportunity to play extreme golf through a huge river valley. 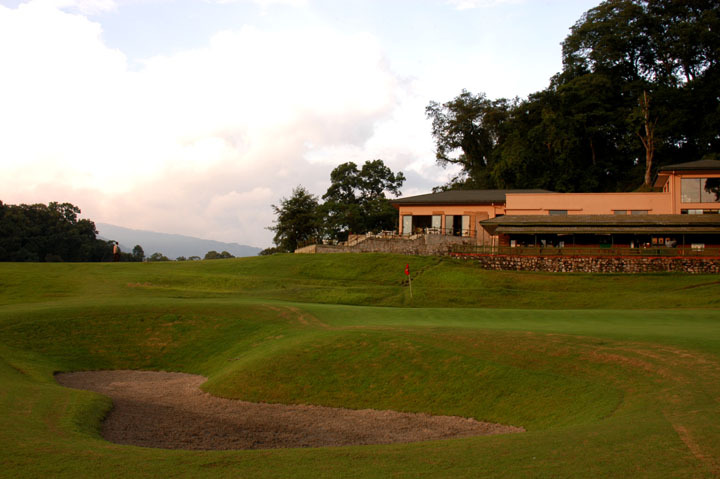 The Phulbari offers a beautiful resort and some breath-taking golf shots and views. Caddie's Summary: WOW. It is that simple. WOW. Imagine playing in a remote and exotic country. Now surround yourself with ice-capped mountain views. Now picture a huge valley cut from the earth. In the center of the valley a pristine, blue/green river flows roughly through. 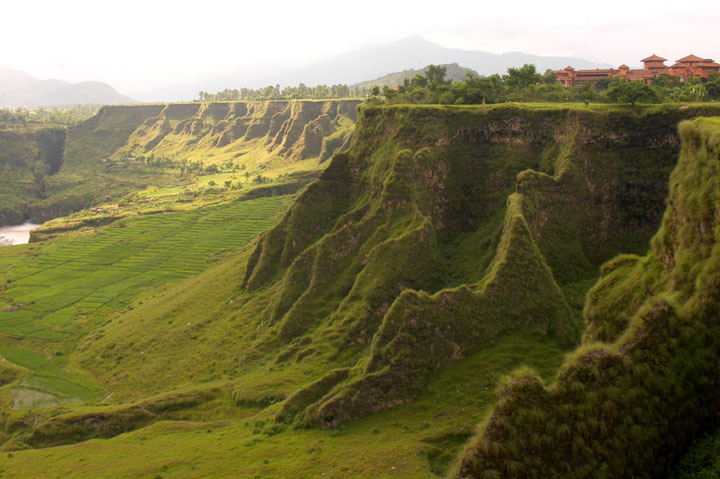 Now place the coolest golf course you've ever seen etched into the landscape. You are at the Himalayan Golf Club in Pokhara, NEPAL. The hotel and lodging is years (with good economy) from being finished, and I blew out my motorcycle rim and tire getting to the place, but it is all very well worth it. 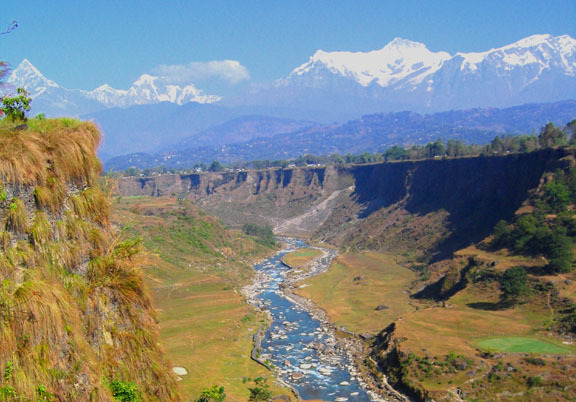 Possibly, the most unique golf course in the world, the Himalayan stretches along side the Bihaypure River and all elements are kept natural. The only drawback the course has is the barbed-wire fences around the greens, but you'll learn to accept them as you navigate around water buffalo and grazing cattle. We have photos from our scouting trip (August) as well as some January photos supplied by the course (low image quality but amazing scenes). Rainy season, monsoon, ends by October and the skies usually clear at that time, allowing the most breath-taking scenery imaginable. Enjoy the views. Caddie's Summary: The ONLY truly international course in NEPAL is Gokarna Golf Resort. It has the layout and conditions of some of the best courses in the United States. And the Resort is simply incredible. If you have ever wanted to escape for a week or two and play some fantastic golf, kick back in a 5-Star Zen Resort, and help yourself to amazing spa treatment, this is your destination. The resort has a beautiful indoor swimming area, spa (possibly the best in all of NEPAL), and great golf. People travel from all over Asia to play this venue. The golf course is placed in what was formally the king's private hunting reserve and still maintains its natural character, as only 15 acres were actually cleared to design the course. Ohhh, and best of all, the same golf course architect that designed Bandon Dunes in Oregon (top 50 course in the United States), designed Gokarna. You are sure to see small barking dear, monkeys and other natural wildlife and you only have to travel twenty minutes from the airport. The resort has a restaurant with three master chefs preparing foods from India, Nepal and the West. All through-out the resort are comfortable seating areas, cocktail areas and sculpture. This is a rare treat for any traveler. The modern Zen design is present through the architecture, room layouts, and corridors. The Owner has done an amazing job on the development of this project, and it shines through the staff that gratefully comforts all visitors.